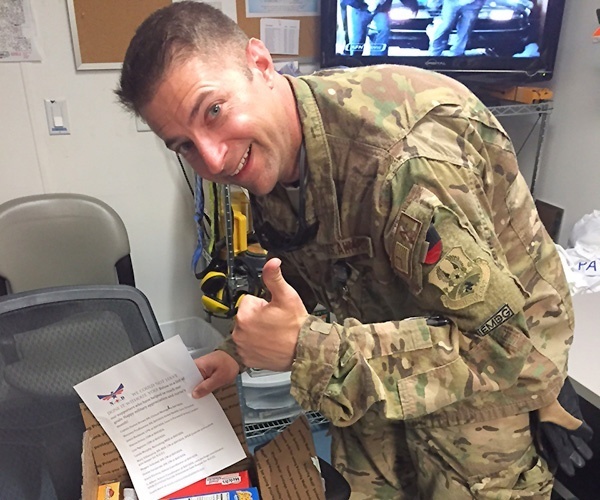 While away in Afghanistan, Captain Duston Brown opens a care package from his BAYADA team members. Working for BAYADA as a registered nurse clinical manager for nearly three years, Captain Duston Brown was part-time in the Air Force on reserve duty when he was called upon for active duty in March. While in Afghanistan, he was in charge of stabilizing patients and assessing whether or not it was safe to transport them to another base for specialized care. Just in time for Thanksgiving, his BAYADA friends and colleagues welcome him home.